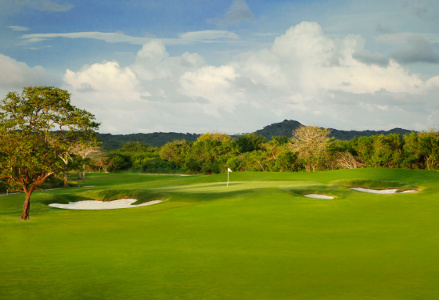 The PGA TOUR, Karibana Golf Club and Sport Link officials recently announced that the newly named TPC Cartagena at Karibana in Colombia, which is anchored by a Nicklaus Design course, will play host to a new Web.com Tour event, beginning in 2015. The Karibana Championship will feature a 144-player field and a purse of $700,000 USD. It will be part of the Tour’s early-season launch in Latin America in 2015. A four-year agreement, through 2018, is in effect. The championship golf course created by Nicklaus Design opened for play in December 2012 and provides a spectacular Caribbean setting on Colombia’s northwest coast. The development of the property is being led by the Mildenberg family of Bogotá, Colombia. The announcement strengthens the PGA TOUR’s presence in the region, which includes five 2014 Web.com Tour events in Latin America and the launch of NEC Series-PGA TOUR Latinoamérica in 2012. The Karibana Championship joins the Pacific Rubiales Colombia Championship presented by Claro, which debuted on the Web.com Tour schedule in 2010, in spotlighting Colombia on the international golf stage. This year, three Web.com Tour events are hosted at Nicklaus Design courses, including the Midwest Classic at Nicklaus Golf Club at LionsGate in Overland Park, Kansas; the Hotel Fitness Championship at Sycamore Hills Golf Club in Fort Wayne, Indiana; and the Nationwide Children’s Hospital Championship at The Ohio State University Golf Club–Scarlet Course in Columbus, Ohio. The three Web.com Tour events are part of a company record 25 TOUR-sanctioned events hosted on Nicklaus Design layouts in 2014. With the addition of the Karibana Championship, the Web.com Tour has events in Brazil, Chile, Colombia, Mexico and Panama.